VA Governor Ralph Northam must resign now! This week, racist photos of democratic Governor Ralph Northam surfaced. 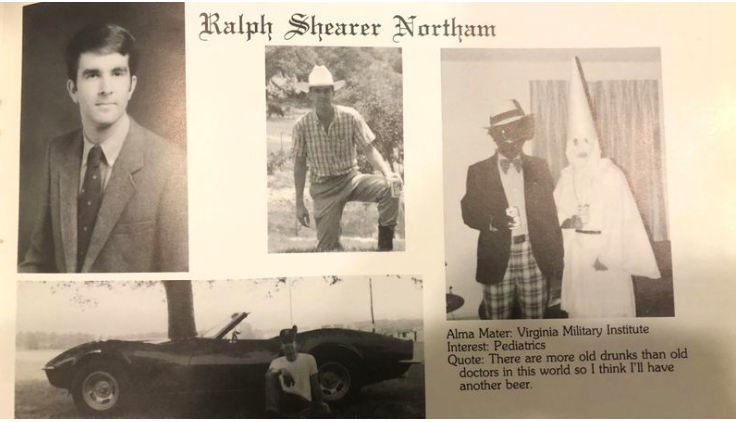 The photos, grabbed from Northam’s 1984 Eastern Virginia Medical School yearbook, show the current governor of Virginia dressed up and smiling in a photo of two men drinking beer, one in blackface and another in a KKK robe and hood. These photos are disturbing, and leave us with no other choice but to demand his resignation now. Governor Ralph Northam is not fit to represent the people of Virginia. He must resign immediately. The photos alone are enough to prove that Governor Northam is not fit to represent the people of Virginia, but the implications are even greater. This isn’t just a one off incident, but part of a disturbing history that includes him going by the name “coonman” — a racial slur — in high school. Though he won’t admit whether he was in Blackface or dressed as the klansman, both are unacceptable. The fact that he was at this party at all demonstrates, at minimum, a stunning lack of judgment and calls into question his values and integrity. We know that when these types of degrading characterizations rule the day, it reinforces biases that have a devastating impact on our communities. The real-world consequences of normalizing these tropes include inferior medical treatment, harsher sentencing by judges, and a higher likelihood of being shot by police. A man in his twenties, Northam attended this party during a time when he was studying to be a pediatrician; in years prior he served on the honor council. In other words, this was someone charged with making potentially life or death decisions about how to treat children of all races, and impartially doling out justice to his fellow students, a number of whom were Black. Today Northam has decision making authority that impacts the lives of over 1.5 million Black Virginians. Our mission goes beyond political party. Our foremost concern is, and always will be, the health, safety, and dignity of Black people. We demand his resignation now. Black people are not a costume and our country’s racist history is not a light-hearted game. Blackface, previously considered an art form in this country, stereotypes and dehumanizes Black people, characterizing us as inferior and incapable. Paired with the man dressed in KKK garb, this yearbook page illustrates a disgusting display of uninhibited racism. Governor Northam paved his path to governor by visiting “two or three” Black churches “every Sunday.” He built his political career on the backs of Black people. He cannot be allowed to continue to represent us, the people of Virginia, or the Democratic party. You are a shameful representation of the people of Virginia. Your racist photos in your medical school yearbook indicate a clear disrespect and dehumanizing of Black people -- not only those who live in Virginia, but those across this country. Your photos contribute to a culture that treats Black people as stereotypes and tropes, and causes lasting, real-world consequences for Black people including inferior medical treatment, harsher sentencing by judges, and a higher likelihood of being shot by police. Black people are not a costume for you to try on. We are human beings, and we deserve to be treated with respect. Governor Northam’ you built your political career on the backs of Black people, and these photos show blatant racism and disrespect for the people who helped get you elected. In light of these heinous images surfacing, we are calling on you to immediately resign as Governor of Virginia.